Happy Easter Season! 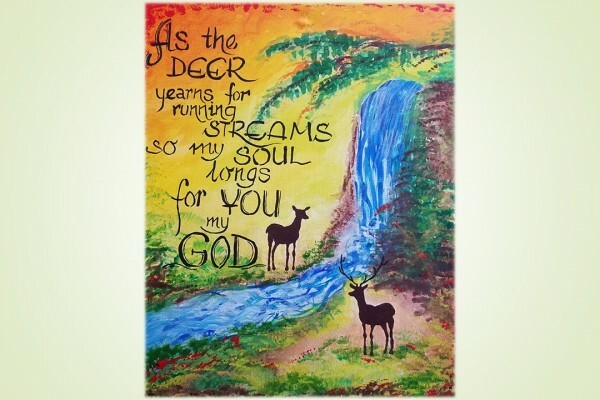 This Easter Vigil I had the privilege of attending a local parish at which the Pastor chose the following verse as part of his homily: “As the Deer yearns for running streams, so my soul longs for you my God” (Ps 42:1). It was one of the responses to the readings that were used in the beginning of the Vigil Liturgy. I was delighted because this verse happens to be a favorite of mine. Recently, I was speaking with a sister and she asked why I liked this verse and what did it mean to “long for you, my God.” I had to think for a moment, then said that we are constantly yearning to be filled with God. We are never satisfied -- we need God to fill up our lives. After the hard days of Good Friday and Holy Saturday, the Resurrection on Easter Sunday is such a joy. Mary Magdalene, Mary, the Apostles -- they were grieving and scared and so wanted to be with Jesus. He came to them and brought them peace. The joy they experienced is indescribable. They needed to be filled with Jesus so they could continue the mission of spreading the Good News of the Gospel. Where do we find the running streams that fill us? Each of us does it differently but one of the greatest sources is our prayer life. Another source are those people who uplift us and encourage us to be our best. Being present to others and helping to serve their needs can also fill us. What really matters is that we have a balance of ways to help us along our way. And as in all things, God will provide those running streams. My prayer for you this week is that you are able to drink deeply as you yearn for that living God, that you see Him in the faces of those you meet and that you continue to be joyful as your soul longs for our loving God. The picture for this week’s reflection was painted by Sr. Francesca Witkowska.